Mayhew couldn't run without our volunteers. If you are interested in volunteering with animals then look no further. Mayhew relies on over 1,000 hours of volunteer time per month! From dog walking and cat socialising to our reception team and adoption home checks, our volunteers are essential to everything we do. They dedicate their valuable time to help animals and people in need and assist our full time team in their day to day jobs. Our volunteers can work in kennels and cattery with cleaning, socialising and walking dogs. It is important for us to have the help of volunteers who can spend time with individual animals – this increases their chances of being adopted. These roles are very sought after and we do not take applications for these unless we are advertising a vacancy on our website. We also take volunteers for a number of other areas including reception, events, fundraising, home checking and Trustees. 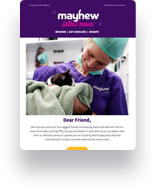 Why should I volunteer for Mayhew? Giving your time, skills and creativity will make an amazing difference. Our application process includes an interview and an induction. * Please note we will not accept applications for roles in kennels or cattery unless these roles are advertised on our website. For any questions about volunteering, please get in touch with our Volunteer Coordinator, Linnea Brunzell. Mayhew is proud to have been awarded an Investing in Volunteers accreditation. Investing in Volunteers (IiV) is the UK quality standard for good practice in volunteer management. A volunteering role for you and your dog to do together.